Many countries in Central and South America have made significant progress toward eliminating malaria. Between 2000 and 2012, 13 countries in the Americas saw malaria incidence rates drop by more than 75%. Argentina, Belize, Costa Rica, Ecuador, El Salvador, Mexico, and Paraguay have all reached the pre-elimination phase, a designation given by the World Health Organization when countries meet certain critical steps in eliminating the disease and preventing its reintroduction. While this progress is encouraging, efforts to eliminate and control other global threats like polio illustrate that the last cases are often the most difficult to address. In the case of malaria, fewer cases bring new challenges in ensuring the supply and proper management of antimalarial medicines. Paradoxically, when incidence drops and fewer medicines are required, managing the supply of those medicines becomes more challenging. Areas with low incidence of malaria often face difficulties in procuring lower quantities of medicines, properly storing medicines for longer periods of time, and getting medicines to malaria “hot spots” (areas with relatively high rates of malaria within low-incidence countries). The USAID-funded SIAPS program, through the Amazon Malaria Initiative (AMI), works to find sustainable solutions to each of these challenges. Many times countries with relatively few cases of malaria experience difficulties in procuring small quantities of medicines as vendors have little incentive to continue marketing activities in low-incidence areas. Additionally, when countries conduct quantification exercises for antimalarial commodities using the standard methods, areas with no malaria cases in the previous year will typically not receive medicines for the following year, even though the risk for new cases to emerge still remains high. To help address these issues, SIAPS has helped countries implement a pooled procurement system for first-line antimalarial medicines, taking advantage of the Pan American Health Organization’s Strategic Fund which already pools procurement for other public health supplies. The Strategic Fund combines the antimalarial orders of all low-incidence countries in the Amazon Basin region, negotiates prices with suppliers, and places a bulk order each year which it then distributes to the countries. SIAPS continues to support the Strategic Fund by working to identify and eliminate potential bottlenecks in the pooled procurement system. SIAPS has also established a recommended minimum level of antimalarial stock for areas where no cases occurred during the previous year. Should an outbreak occur, this minimum stock guarantees that treatment will be available to prevent or treat any potential future cases. Working with technical staff from six countries, SIAPS developed and validated criteria for planning, distributing, and managing antimalarial medicines in these low-incidence regions. Additionally, in low-incidence areas the turnover of medicine stock is lower, meaning that medicines may need to be stored for a longer period of time than in higher incidence areas. In hot, humid conditions where the threat for malaria is greatest, longer storage times increase the risk that medicines are exposed to conditions that adversely affect the medicine quality and shelf life. As a result, SIAPS has created a set of low-cost solutions for primary care facilities to help lower the internal temperature in pharmacies, improve storage conditions, and extend the life of malaria medicines in tropical areas. SIAPS has also worked to address isolated malaria hot spots in the Amazon region where the number of cases still remain high, despite a reduction in regional levels of malaria. The gold mining regions of Suriname, Guyana, and Brazil, for instance, continue to experience higher rates of malaria in part due to difficulties in accessing these hard-to-reach regions. Workers from the mines, typically the most at-risk group in these areas, may delay or avoid seeking treatment either because they are in the country illegally or because they fear missing a day of work. 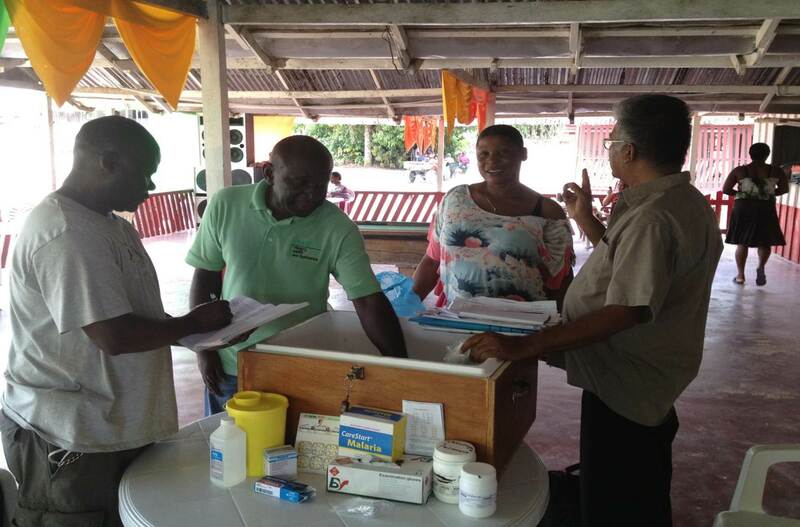 In 2013, SIAPS conducted a knowledge, attitudes, and practices (KAP) study to better understand the health-seeking behaviors among populations in Suriname’s gold mining region. Based on the results of the study, SIAPS helped to develop interventions to improve malaria treatment for this at-risk population. While there has been a great deal of success in reducing the burden of malaria in the Americas, now is not the time to scale back interventions, but rather, to consider the challenges prompted by a drop in incidence and to learn from countries and regions that are already in the pre-elimination phase. 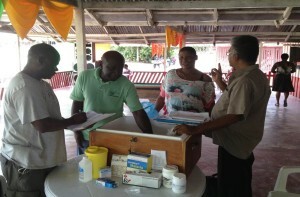 By ensuring treatment availability in remote and hard-to-reach areas, improving storage conditions, and securing a reliable supply of medicines, SIAPS is working at the last mile of pharmaceutical management, to find the last cases, so that we can look forward to the day when malaria can be eliminated from the Americas. World Malaria Report 2013. Geneva: World Health Organization, 2013.